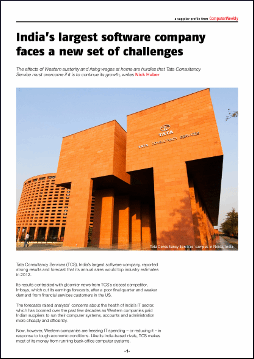 This 5 page special report gives you the facts on TCS, its strategy, products and services and financial performance. Its revenue for the year to 31 March 2012 was $10.1bn (£6.4bn), up 24% from the previous year. It does business in 42 countries and has about 238,000 employees. TCS is listed on the National Stock Exchange and Bombay Stock Exchange in India. Tata Consultancy Services (TCS) is India’s largest IT and consulting company, ahead of Infosys and Wipro.